I’ve used Tapioca Pearls (used for Boba/Bubble Tea) as I wreaked my Sago Pearls by adding cold water before putting the pot on top of the stove. Never, never do this….always remember, add your Tapioca or Sago Pearls when your water boils. There’s a big difference between Tapioca Pearls that is used for your Boba/Bubble Tea and Sago Pearls. Tapioca Pearls turns into soft black gummy pearls while Sago Pearls turns into soft translucent pearls. ~ In a medium sauce pan, combine your 1 cup of water, vanilla essence, brown sugar and white sugar. Place in your stovetop and bring the mixture to boil. Lower your heat until your sugar mixture is just gently simmering. Simmer for approximately 30 minutes or until the mixture reduce in half. You can tell that your sugar syrup is ready once you see lots of bubbles on top. Remove the saucepan from your stove and let it cool down. ~ In a small saucepan, pour the 4 cups of water and bring it to boil. Add in your Tapioca or Sago Pearls and reduce your heat to simmering stage. Simmer for approximately 30-45 mins or until the Tapioca turns into soft black gummy pearls, while with Sago…it will turn completely translucent. Both should not have solid centres, if they do cook the pearls further. ~ Once cooked, drained the pearls into a sieve and rinse with cold water under your tap. Place in a container and pour in a ladle of sugar syrup and set aside to cool down. ~ In a large saucepan, pour in 1.185 litres of water and mix in your Tofu Mix with a whisk. Whisk briskly until you can’t see anymore lumps of powder. Place your saucepan on top of your stovetop and bring to boil while you whisk the mixture. Do not leave the saucepan as the mixture have the tendency to boil over the top. ~ Reduce the heat into medium low to achieve very gentle simmer. Simmer for around 3-4 minutes. Quickly whisk in your Coagulant Powder and make sure there are no lumps. Pour your Tofu Pudding Mixture into a glass or stainless bowl. ~ Cover with cling wrap and let it rest for 20 minutes or until set. I’ve tested mine by gently shaking my glass bowl, it wobbled like a delicate jelly. ~ Taho (Filipino Sweet Tofu Pudding) is highly recommended to be served freshly cooked, while your Tofu Pudding is still warm. Your 3 main cooked ingredients should be all ready before serving. Taho is best eaten just a few seconds after assembling as the soy water from your Tofu Pudding tends to seep out of the Pudding itself and it dilutes the sugar syrup too much if you let it stand assembled for a few minutes. ~ Using a shallow ladle, dispose any soy water from the surface of the Tofu Pudding and then lightly shave a piece of Pudding with your ladle and slide it to your individual serving container. Reason why I said to shave instead of scoop is that it gives more attractive presentation as big chunks would tend to crumble. Once in awhile as you’re “ladle shaving” your Pudding, skim the top surface of the Pudding and get rid of the excess soy water. Fill up your individual containers approximately 3/4 full. ~ Place 3-4 spoonful of sugar syrup on top of your individual serving container (depends on how much you want) and then place a couple of spoonful of pearls. ~ Serve immediately . Good for 4-5 large servings. What is good with Homemade Taho is that you can double the amount of sugar syrup and the Tapioca or Sago Pearls to your liking. You can purchase the House Tofu Mix in Inala or Yuen’s Asian Supermarket in Brisbane. I love taho esp. with lots of tapioca! Gorgeous Taho! Not only that aside from having the right servings of black pearls, you can also adjust the sweetness, or having the option of not putting the syrup if one has a tendency of monitoring sugar intakes! Thanks for sharing! Thank you for sharing your taho recipe. I also llike the tutorial about sago pearls. You know i tried making sago myself and always fail to do so. Yoour tip on making it will definitely make the difference when i make it next time. I will remember to put it on a boiled water haha. @Malou~ OMG, I've done it several times now, wreaking tapioca and sago pearls by adding cold water...so simple but I always have this mental block on how to cook it...so weird! Yawzer! That is my sister's favorite dessert :) I only like the sago part. I have not had taho in a long time. I want to make them from scratch, too. Gonna look for that Tofu Mix here. @Anonymous~ I've found this brand of Tofu Mix here in Brisbane in Yuen's (Fortitude Valley or Sunnybank) or any of the Inala Asian Stores or even Burlington in Fortitude Valley...just check this places, am sure you'll find a box, in their Japanese Section. I lol at Wok's dad's joke. I like the arnibal part. Hmmm Now I can make my own (verry sweet) taho! I just hope I can get the ingredients here. Thanks for sharing! My sister and I was told about the House Tofu mix and immediately went looking for one here in Calgary. Lo and behold... the Asian store is out of stock. Should I have searched on-line long ago... I would not be in this dilemma. Thanks for your post. More power to you! @Jess~ try mo 4 3/4 cup water (check mo yong measuring cup mo is 240ml). You put the coagulant powder after simmering yong tofu mix powder 3-4 minutes, whisk it quickly until dissolved (no lumps visible), that would take about 5-10 seconds of whisking...then pour it to your cooling bowl, good luck! @Jess~ glad to hear that =) Maybe also let it set longer to make firmer. 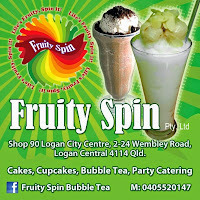 Where to buy the Tapioca and Sago Pearls in Brisbane? Which Asian store? Thank you. Tapioca...Inala Asian Stores & Yuens with Sago you usually find packets at Best Friends or the Bayanihan in Inala. can you help me to find taho vendor?? pls.